"Elle" - Exploring the European Inland Waterways: Canal entre Champagne et Bourgogne: Froncles – Riaucourt - Chaumont – Rolampont – Langres. Canal entre Champagne et Bourgogne: Froncles – Riaucourt - Chaumont – Rolampont – Langres. 64,2 kilometers, 33 locks, 5 lifting bridges, 1 tunnel. 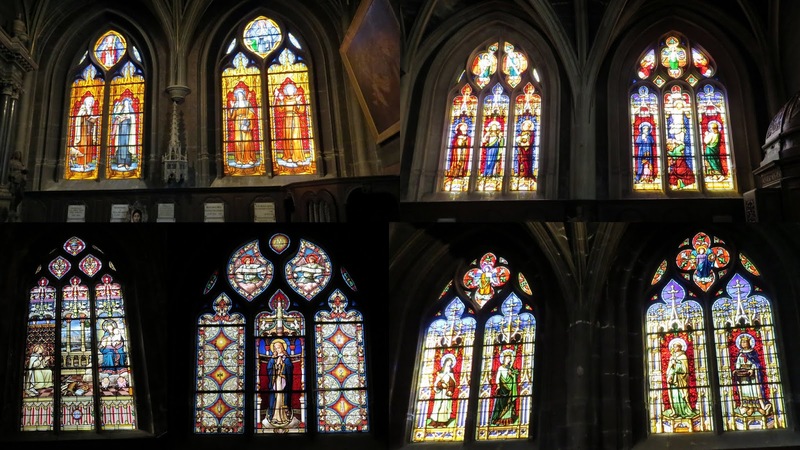 Sunday 1 July – Froncles to Riaucourt. 16,5 kilometers, 6 locks, 1 lifting bridge, 3 hours 40 minutes (including delays at 1st lock). Let’s try this early start plan again. Up early on a breathless day, filled with the promise of much warmth, in order to catch the locks in our favour, we arrive at the first lock at ten to nine and none of the lights are working. And now what? Well 'bright-and-earlies', it’s Sunday isn’t it? And what time do the locks start operating for both commercial and leisure traffic on Sundays? Yes – nine o’clock. So we hang around until nine when the red light comes on signifying that the system is working, press the ‘amontant’ button on the telecommand, and nothing happens. Press again. Nothing. Frustratingly we can see that the lock is empty so we call the prescribed number and the nice lady seems to know exactly where we are and, without further ado, the small gap in the lock door closes and the lock fills up and the upstream gates open – and stay like that. Another call. “Madame, we are waiting to go into the lock to go upstream, why has the lock filled against us?” She will attend to it. We hear the bells ringing, see the upstream doors closing, the lock empties and, at nine thirty, we finally get into the lock. So much for early starts! Rescuing a pigeon from the lock. despite lock rises of nearly four meters (the locks on this stretch are pretty gentle) and we finally decide on stopping at Riaucourt rather than Bologne at which lock the lockie was selling truffles, however at €40 for the smallest jar, we declined – but he did present us with a huge courgette as a gift! Unfortunately, on arrival at Riaucourt, we are obliged to interrupt a celebratory lunchtime gathering of a group who had hired a boat with skipper who had parked their ten meter boat in the middle of the twenty meter quay – neither clever nor polite. Riaucourt mooring with the offending charter boat in foreground - after they had repositioned to allow us space. But they left just after two and we enjoyed a late lunch of Cuisse Carter, luckily having a following breeze blowing down our hatches to bring some relief from the 33C heat. Riaucourt is a very pretty, garden filled town but apart from a hospital there was not a single commercial enterprise to be found – those pain chocolate will have to wait. You know it's a country town when the sheep have their own plot in town. Monday 2 July – Riaucourt to Chaumont. 9 kilometers, 5 locks, 2 lifting bridges, 1 tunnel (320 meters), 2 hours. A lifting bridge with the lock immediately following. The 308m tunnel at Condes - good lighting comes on as you enter. Looking back past the lift bridge to the tunnel. we arrive at Chaumont, leaving the sunflower covered lands in favour of a port with all the facilities. As we have a full tank of water we choose to forgo the €2,50 water charge and only pay for mooring (€9,85 per night - 12m to 17m boat) and electricity (€2,80 per night) but we also have to pay the ubiquitous 22c per person per night tourist tax. A bit on the expensive size but we decide that the fridges need electricity to cope with the day. With temperatures rapidly approaching their afternoon high of 33C, all we can do is take the bikes to the nearby eLeclerc for provisions and then drape Elle with all kinds of shadery (which covers the solar panels which is why we need electrickery) while we braai and pass the time in the relative coolth of the saloon. The 17thC Jesuit Chapel - you have to obtain the key from the Mairie. A memorial to Edme Bouchardon, born in Chaumont. The covered market on the left. Looking down to the Mairie. A lovely home - Villa Des Roses. Tour d'Arse - part of the old city wall. in progress inside so we will revisit it. "I'm sure we've been up this road before!" but finally after about five kilometres of the fourteen hundred meter return trip we are back, bikes and backpacks dumped and, with a rumble of thunder, the heavens opened to cool the thirsty earth. Let's start that again: The next morning we unloaded the bikes and eventually set off on our re-exploration of Chaumont, starting with the six hundred meter long, fifty two metre high, fifty arch, 19th Century dressed stone railway viaduct, Western Europe’s greatest such structure. Lynn dwarfed by the viaduct. and back into town and on to the Basilica of St John the Baptist – a really lovely Gothic edifice. 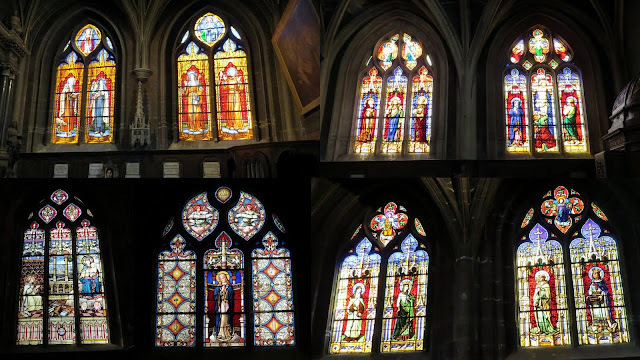 A collage of stained glass windows. and the adjacent, quaint Museum of Art and History. The original castle of Chaumont - note the square tower which was the dungeon of the Counts of Champagne. The €2 per person tickets to the latter also gave us free entry to the small Nativity Crib Museum. Nativity creche - one of quite a few on display. And then it was a quick ride back to Elle, boarding just in time to miss the passing afternoon thunderstorm. The stay at Chaumont ended with us hosting Co and Reiny from Namasté for a bubbles evening. Thursday 5 July – Chaumont to Rolampont. 29 kilometers, 15 locks, 1 lift bridge, 6 hours 10 minutes. From lock 22 (Chamarandes) to lock 4 (Jorquenau) there are sections of locks which are still manually operated and, consequentially, you have to advise the VNF of your departure time from Chaumont, where you will be staying between there and Langres and what time you will be departing from such interim stop. We had arranged an eight o’clock departure and had been told that we would be locking through with another boat but at the appointed hour we were the only ones about in the grey and drizzly weather. Just before the first manual lock we saw the VNF vehicle come down the towpath, stop, reverse and when we arrived at the lock the young lockie was there to accompany us through the next six locks. On arrival at the Foulain lock we were advised that the two fifteen meter pontoons were fully occupied and that we should look for another mooring, as long as we did not go further than Rolampont – the locks between Foulain and Rolampont are once again automated and we presumed that the locks after Rolampont were manual again. With the weather starting to clear we continued on our way up the rural landscape, making mental notes of any possible stopping places in case the thirty meter quay at Rolampont was full, something which was quite expected as it provided free water and electricity and did not have a stay limit. Looking back at the lifting bridge and services bridge. Much to our relief there was only a small, blue ensign decked yacht tied almost in the middle of the open space but there was still plenty of room behind them for us to tie up. A short walk into town revealed little of interest; the hotel and restaurant has closed down and apart from a very good boulangerie there is only a small bar serving burgers and the like where we stopped for a beer in the now hot and humid weather. We had heard that there was an Emmaus second hand goods depot back at Foulain so the next day we unloaded the electric bikes and cycled the towpath for sixteen kilometres until we found the place which looked like a browsers dream but where we were most rudely informed that, despite the doors being open and human activity to be seen inside, they were closed and would only open at two thirty. So we rode sixteen kilometres back again with my battery giving up with two kilos to go – a replacement battery seems to be on the horizon if only twenty five kilometres is now the maximum range, a long way off the forty kilometres when we bought the bikes. The afternoon was spent ‘at leisure’ and at sunset we were ‘entertained’ by the disabled Yanqui partner of the English, ex-schoolteacher, skipper of yacht Resolute who, after having proof read a lengthy manuscript on the American civil war over the phone at the top of her voice (I could hear every word of the thirty minute monologue – interesting but an annoying interruption to a very good Ken Follett novel) managed to manoeuvre herself and her guitar into the yacht’s cockpit and, with skipper keeping time on a bongo type instrument, proceeded to belt out Woody Guthrie like country music in a caterwauling, bluegrass, voice. So much for sunset serenity so we banged close the door and hatch, which helped a bit, and endured until the noise stopped at about nine thirty. Saturday 7 July – Rolampont to Langres. 9 kilometers, 7 locks, 1 lifting bridge, 2 hours 45 minutes. A most uneventful cruise in the most perfect weather with all locks automated and the only need for the VNF was the lifting bridge which is still manually operated. There was lots of space at the long quay with free water and electricity, the latter being switched on for one hour three times a day – clever! By evening the port would be nearly full with eleven boats arrayed against the wall. it was bikes off and we forayed up to the Intermarche for supplies; the town looks a daunting uphill ride of apparently one hundred and forty one meters rise from the canal. the American couples electric 'toys'. The boat has a diesel engine. After a day ‘off’, Monday morning saw us e-biking easily up to the walls of the gorgeous, medieval, fortified town with its labyrinth of roads often leading to alleys opening out onto the ramparts. Our mooring is down there. The bridge 100m from the port. An alley leading to the House of Enlightenment. The House of Enlightenment, now a museum. The Museum of Art and History. A mosaic from Roman times in the precise place it was unearthed. A tapestry, one of eight commissioned by the Cathedral. Another hangs in the Louvre. Formerly a bank, this building is for sale. Make a nice townhouse. The somewhat squat 12thC Cathedral of St Mammes. Another of the tapestries. The statue is of St Mammes. One of the city gates. Midday saw us taking a break from the sun at the very dinky Restaurant D74 (we still have no idea what ‘D74’ refers to) and enjoying a delicious pork knuckle. The entrance to the restaurant. The terrace - thirty minutes later it was full. Back at the once-again full port we chatted to Co and Reiny on Namasté who seem to have a couple of duds in amongst their collection of ten (!) house batteries. They will be leaving their boat here for a week while they return to Holland for grandchildren’s birthdays. The Denis Diderot House of Enlightenment Museum - 16thC on right, 19thC on left. Art and History Museum closed Tuesdays. edited partly by Diderot and for some of the content of which he was jailed. A Renaissance style house, unfortunately locked. with Lynn returning via the Intermarche with provisions as there appears to be a dearth of supermarkets looking ahead. Everyone who arrives at the port should make the effort to get up to the town as they are really making an effort to attract tourists in the face of a declining population; there is a bus costing one euro which departs from the nearby station on the hour, or the walk which takes about forty minutes apparently. Tomorrow we set off for the summit of this canal, through the 4,820 meter Tunnel de Balesmes and complete the start of the forty three ‘downhill’ locks which will take us to the Petite Saône river. PS: The reason I did not accompany Lynn to the shops was that I was pushing a bike all the way from the centre of Langres back to Elle – another puncture! Hello Shaun, We are at Langres now on Piper barge Quercy. We must have passed you at some point, but I have read your blog with interest especially the section on the River Marne as we too have decided to cruise the stretch from Epernay to Meaux with Julian's brother and wife. That will be in a few weeks, but it was good to have an insight beforehand. We are here next to Koroko. It was also interesting to read about your recent experiences as we now have some tips on where to moor and what to expect upstream. Thanks and congratulations on a great blog! Apologies but I have just seen this now (17 July). We did see you at Langres but didn't get around to a chat - pity. Enjoy Epinal and thank you for the compliment about the blog.